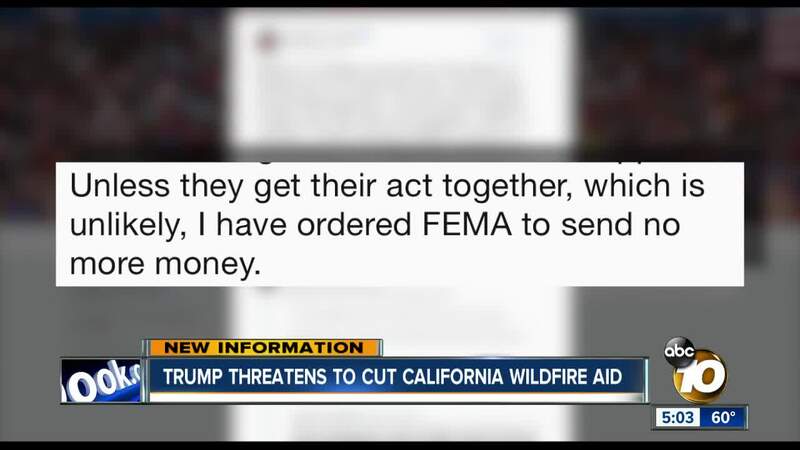 (KGTV) - President Trump says he has ordered a stoppage of federal emergency aid to California, blaming the state for not managing its forests. While the president misspelled forest in his first tweet, he later sent a new tweet with the correct spelling. The president’s latest remarks come one day after California Gov. Gavin Newsom, on his first official day on the job, proposed a $1 billion forest management plan that will be part of his next budget. Newsom also pitched an additional $105 million to help California prevent and battle wildfires. Other parts of Newsom’s plan include an update to the state’s 911 system and improved emergency response strategies . Destructive wildfires erupted all over California in 2018, including the massive Camp Fire in Northern California. The Camp Fire, which erupted on Nov. 8, 2018, and was finally contained 17 days later, killed over 80 people and destroyed nearly 14,000 homes. It is considered the deadliest and most destructive wildfire in the state’s history.